Smuggled gold accounts for over a third of the demand in India, the world’s second largest gold importing nation after China. Undivided AP accounted for 20-25 per cent of the country’s total gold import. Hyderabad: The surge in unofficial import of gold is taking a toll on the revenues of Telangana and Andhra Pradesh, which often voice concerns over revenue loss upto Rs 10,000 crore due to GST. On a conservative calculation, each Telugu state is foregoing Rs 500-800 crore in revenue in the form of three per cent state GST on gold and making charges, as the yellow metal is sold in the grey market, avoiding taxes, according to a senior official at GST Bhavan here. Smuggled gold accounts for over a third of the demand in India, the world’s second largest gold importing nation after China. This potentially causes a revenue loss of $1.3 billion to the central government. Undivided AP accounted for 20-25 per cent of the country’s total gold import. Bullion analysts peg weightage of gold imports between TS and AP at 40:60 ratio. TS has a 10 per cent share and AP 15 per cent stake in total gold imports. Based on this, the expected annual revenue loss for AP due to smuggling is `780 crore and Rs 520 crore for Telangana, according to the official at GST Bhavan, who doesn’t wish to be named. Official imports are down by almost 50 per cent, while smuggled gold volumes are on the rise. “Gold imports in AP are down by more than 20 per cent. Adding to this, the jewellery market has been sluggish owing to less currency rotation, unattractive price rise, availability of other financial instruments and know your customer (KYC) norm, etc,” said Raju Manchukonda, managing partner of Visakha Bullion. On an average, 45 kg of gold is caught being smuggled in at Shamshabad airport every month. “This is the tip of the iceberg,” says Boorugu Mahabaleshwara Rao, president of the AP Bullion Merchants' Association. “The cost of unofficial imports is estimated to be five per cent. Excluding this, if someone buys in the grey market, jewellery would be cheaper by 7-9 per cent. US dollar price rise also impacts. 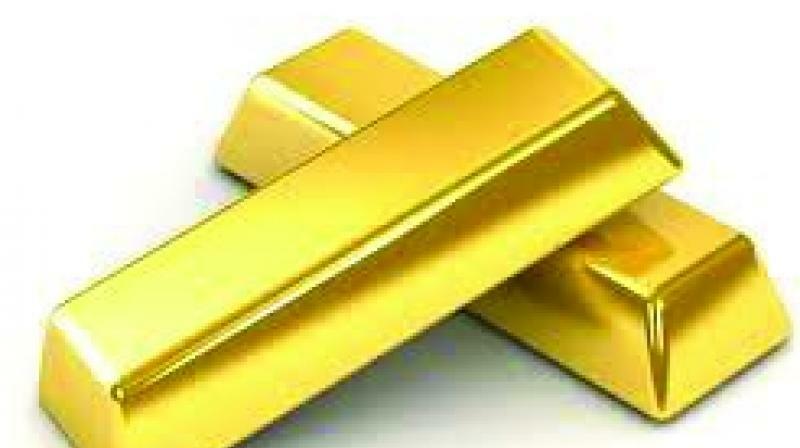 One cent rise will increase gold price by `23.25 here,” Mr Rao told Deccan Chronicle. Gold smuggling has been rife ever since import duty of 10 per cent was imposed by the Centre in August 2013. Now, 10 per cent customs duty, three per cent GST, and three per cent on making charges makes a total tax load of 16 per cent. Earlier, the tax break-up was one per cent VAT, one per cent service tax and 10 per cent customs duty, a total of 12 per cent. If government slashes customs duty by five per cent, it will generate more revenues, observed Satish Agarwal, proprietor of Kundan Jewellers and Exporters, and former vice-president of the Twin Cities Jewellers' Association. “GST and note ban hit the bullion and jewellery markets. Generally, people travel during summer vacation so they don't buy in summer. Adhik maas is over now. We expect sales to revive in the days to come and good volumes during this Diwali,” adds Mr Agarwal. To avoid some of the taxes, there is more under the counter buying. “Buying without a receipt fetches me five per cent margin. I don't bother about a receipt. The jeweller also is not worried about it," said a buyer after purchasing a gold chain from a small jeweller at Dilsukhnagar.